Ok, you sadists, stretch goal. 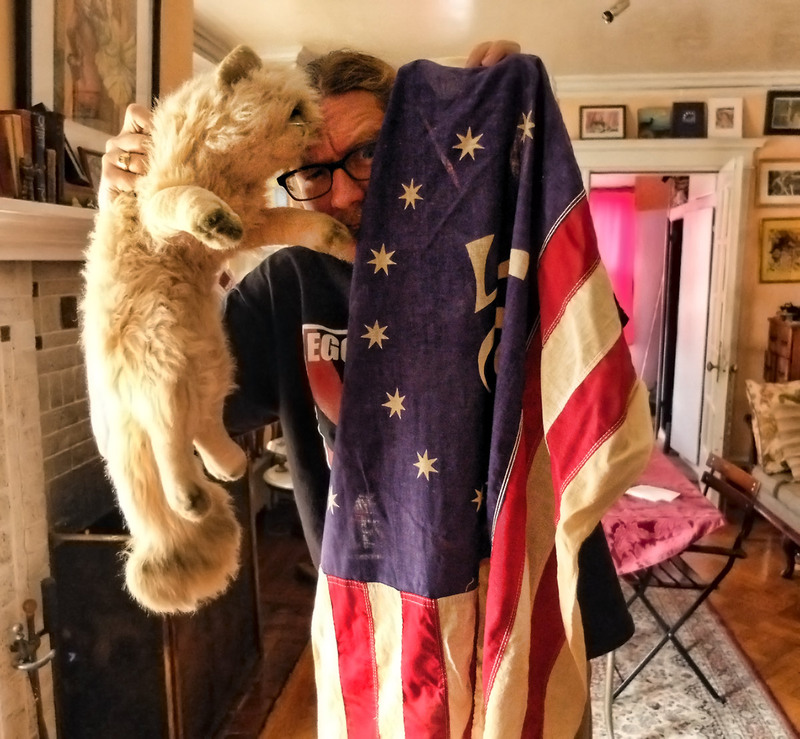 If you can get this to $1,000 I shall run this five mile race dressed as a Continental soldier, AND I will run either carrying a) THIS FAKE STUFFED CAT or b) THIS FULL SIZED BENNINGTON FLAG. I can make this offer with great confidence because I know that you can't possibly make it happen. However, let me know in the comments, in the ridiculous, impossible case that $1,000 gets donated to City Kitties, which of these two things you'd like to see me carrying while running the race. Dumb ideas always begin in a way that sounds reasonable. 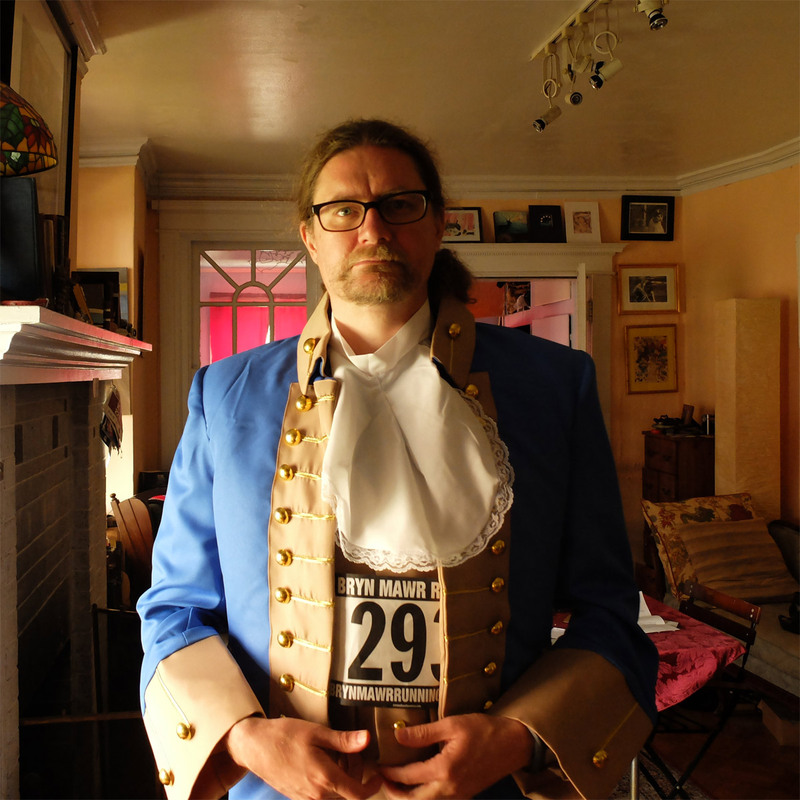 For some reason, a few weeks ago, I thought it would be reasonable to run the Valley Forge Revolutionary 5 mile run dressed as a continental soldier. You know, with a vest, jacket, jabot, knee breeches & tri-corner hat. The short end of it is that I will probably die while doing this because it's five million degrees in this getup, and the closer I got to the actual date, the more likely it became that I'd just start the race in it, wave to the cameras and toss the whole thing in the shrubs by the end of the first half mile. How, I thought, can I keep myself from doing that?. SO ... in order to make my death worth something, and make sure that I can't discard this uniform along the way, I'm issuing an Internet Challenge. If you can donate collectively donate $300 to City Kitties the West Philadelphia stray cat rescue group, I shall make an Agony Mile Video while I do this notoriously hilly run -- every mile, I'll pull out my cell phone and videotape a progress report. You'll be able to hear my gasps, my death rattle, and see the sweat pouring from my body like milk from a busted coconut. Five miles, five reports, and a video of paramedics dragging me across the finish line. Isn't this a video you'd like to see? Click on the link, make a donation, email me your receipt, and if they add up to $300 by Sunday morning, I'll take you along for the ride. THIS CAN'T BE A GOOD IDEA! right to them. You my clickenzee to enfluffy! You're going to need another round of donations to replace the uniform after you drench it in sweat! that's ok. it'll look more authentic then. I might need someone to shoot some holes in the tails with a musket though. 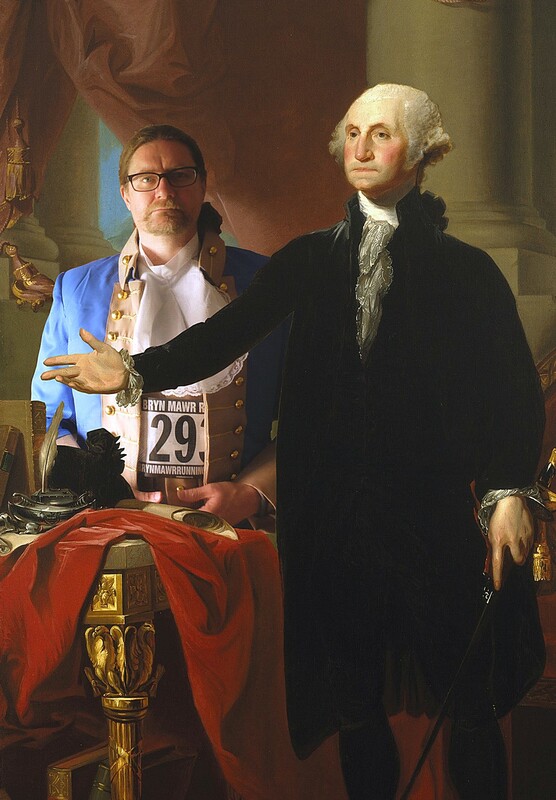 George's threads were all performance fabric, though, right? Well! Good luck, then! Woohoo! The kitties thank you! I weep a little. You should run with Roswell on your head for added content value! all my neck vertebra would be fused together by the end and I'd be four inches shorter. where do I email my receipt? kyle at kylecassidy dot com would be fine! Donation made. Please don't die. if it happens, i promise to pull out my phone at the last minute and get it on tape. Evaporative cooling is your friend. As is ice. Consider soaking and freezing your neck ruff the night before. Donation made! Looking forward to the vid. Receipt sent. This is totally worth my lunch money. It may be worth my lunch money every day this week if need be. yeah, this is definitely one of those things that's going to be fun for everybody who's not me. I just sent them $15. You're insane. You know that, right? At least wear cotton undies. cotton is rotten! i'm wearing some techwicking whatnots. Done! Receipt is on its way. Please don't die... or at least wait until you can get it camera before you pass out. $416.11 raised so far? Ooooh! Come on, gang, let's see if we can get it up to an even $500! Then maybe Kyle will give us a stretch goal reward like, um, a photo of him with the paramedics? And your 'shopped self is so cool I laughed out loud and woke up Barnabas, who was sleeping in the cat bed next to my desk. If you are going to die from this, we should spread the blame/credit around a lot more*. My receipt is on its way. *It worked for Caesar, right? Donation made, stuffed cat voted for.